Most people possess the ability to be the world's best at something, especially if they can make up the specific feat that would immortalize their name in the history books. RecordSetter, a website that chronicles the world's highest, fastest, longest and most-est, makes it easier than ever to be the best at your chosen act, since it lets users submit their own records. "People have said we're the Wikipedia to the Guinness book's Encyclopedia Britannica," RecordSetter co-founder Dan Rollman said in an e-mail to Wired.com. "We don't judge submissions. Whether you want to set a world record for Farthest Distance to Throw an iPod or Most Socks Put on Left Foot While Listening to 'Beat It,' we welcome your record on our site." RecordSetter, which grew out of a 2004 Burning Man camp, has collected more than 10,000 records from more than 60 countries. 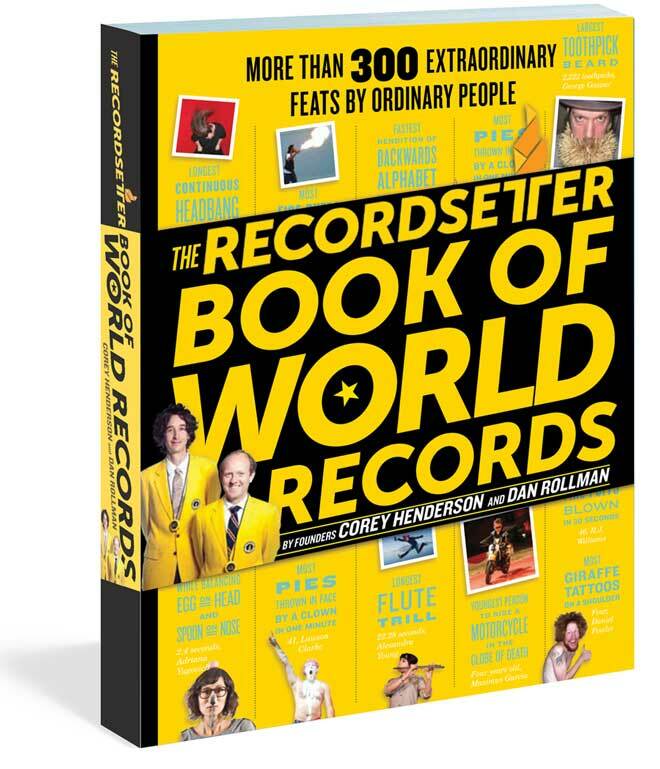 A small sliver of those entries can be found in The RecordSetter Book of World Records, which hits stores Thursday; its 300 entries rank among the very best of the best. To offer a taste of the kind of wacky stunts pulled to break RecordSetter records, Wired.com compiled some high-water marks from people who are doubling down on their 15 minutes of fame (because they're already famous). From Justin Bieber's lightning-fast tweets to Cameron Diaz's bunny love, these are the best celebrity RecordSetter records. Witness the events in the gallery above — they're all nuts.